You’ve been spending time and money on your company’s local search engine optimization strategy, managing your HVAC SEO campaigns while also running your business. Some days, you think what you’re doing is working (maybe, anyhow) while, other days, you know something isn’t right but you don’t know how to fix the problem. What is that agency doing for me? Really? What value, exactly, am I getting for my retainer? Really? To help, we’ve created this guide, specifically created to shed light on what elements go into a typical results-driven local SEO campaign—and, by “results-driven,” we mean one that drives real traffic and leads to your HVAC company. If there are a few techniques included in this guide that are new to you, then you may need to hire a professional local SEO agency. If you already have one, you might need to fire that agency and hire one that gets you the results you need to grow your business. 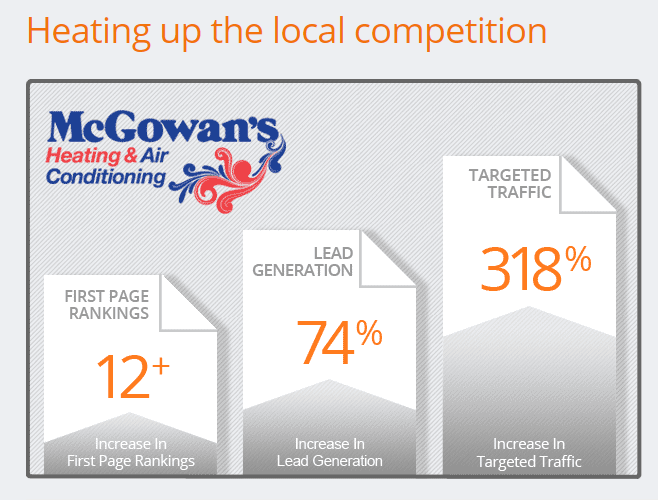 Done well, your HVAC local SEO campaign can have results like this heating and air company. At a minimum, you’ll need to ensure that your name, address and phone number (NAP) is correct. Also include other information to make it easy for potential customers to use your HVAC company, ranging from listing the forms of payment you’ll accept, your hours of operation and how people can contact you for emergency service. Also, don’t forget to write an optimized business description and, at least at first, create Google Posts. If your customers and prospective customers engage with your posts, keep writing them. If not, don’t. But, if you don’t, make sure to still regularly log into your GMB dashboard because other people can suggest edits that, although inaccurate, may be accepted by Google. If you find that information has been incorrectly changed, correct it. This may have occurred because of human input as described above or Google’s algorithm may have found information—say, in an online directory—that conflicted with your GMB listing. Steadily receiving Google reviews is a real plus for your HVAC online marketing and visibility, so encourage satisfied customers to write them about your company. These reviews are a hefty local SEO ranking factor and can really make your listing stand out in Google Maps. To make it easy for people to write a review about your company, you can create a unique link that takes them right where they need to go to write their reviews. Don’t, however, specifically ask for a positive review. Instead, when someone is satisfied with your service, ask them to write one. Here are Google’s guidelines about what is allowable (and not) with Google Reviews. Don’t write fake reviews or ask anyone else to do so. Do create a plan about how you’ll respond to negative reviews, as well as positive ones, and then respond promptly. Getting listed in online directories serves two crucial purposes. First, when people need HVAC services, they’ll want someone local and may therefore check directories to find the right company. And, second, quality citations help boost local SEO rankings and overall online visibility. The best HVAC SEO campaigns focus on steadily getting business listings into quality online directories, with steadily being the key. Too many appearing too quickly can actually harm your rankings. To find more opportunities, consider these questions. What professional organizations do you belong to? Can you be listed on their websites? Also search on Google to find which directories and websites currently contain a listing of your company. Then, make sure they are accurate, especially in regards to NAP consistency. If you find errors, contact those directories and ask that the listings be fixed. From an SEO perspective, this is crucial because Google cross-references NAP information and compares it to your GMB listing. Discrepancies can cause Google to change your GMB NAP and this inconsistency can also cause a lack of trust with Google. If that happens, your online visibility can be reduced. Also use appropriate schema on your own website whenever you list your NAP information. It never hurts to review your keyword research and refresh your strategy, as needed. Some companies conduct keyword reviews annually. Your review timeline will depend upon how effective the keywords currently are for your business and how much they are evolving as the HVAC industry does. When is the last time you refreshed your keyword strategy as part of your local SEO campaign? Are you certain that you’re using the best, most relevant keywords on your site? Is the traffic still good on your chosen keywords? Has the amount of competition changed since you initially conduct your keyword research? As another option, you can outsource your keyword research to a professional HVAC online marketing agency. As you evolve your keyword strategy, monitor what works and what doesn’t, and continue to tweak. It’s crucial that your site is easy for people to use and navigate through to get to the HVAC services they need. And, as a simple SEO strategy that far too few companies use, put the listing of your services to the far left in the navigation bar (and then organize your specific individual services in a sub-navigation menu). Why does this work? Well, by locating the services at the far left, you’ll automatically be sending authority signals to Google that will help with your local SEO campaign, which will help you to become more visible in search engine results pages (SERPs). In the example above this HVAC company has the “About” link first. Our data suggests that website users are more interested in your services first. Web users want to make sure you can solve their problem before they investigate why they should trust you to solve their problem. Plus, when content is valuable and well organized, people tend to stay on a website for longer amounts of time. So, when you effectively organize your website, your engagement metrics (such as time on site, number of pages viewed and so forth) typically increase. Google notes this and, although they have said that engagement metrics aren’t direct ranking factors, a clear correlation exists between higher engagement and higher rankings. When you interlink among your pages in a way that keeps people engaged, this also helps. Finally, boost page speed. Speed has served as a desktop ranking factor for years and is now one for mobile searches. So, test your page speed and receive recommendations to make for improvements. With a faster website, you’ll keep more people on your site. We’re naturally impatient today—especially if, say, an emergency HVAC repair is needed. So, by boosting page speed, you’re improving SEO and making it more likely that prospective customers will stay on your site, rather than impatiently clicking off and going to a competitor who has a faster website, (even if their HVAC services aren’t as good). Then there is the word count. What is the most optimal? Well, it depends. It depends upon your competitors and what they’re doing. So, for example, take a look at how long your competitors’ pages are about air conditioning repair services. Then, create well-written, well-optimized copy that’s about 500 words longer than your high-ranking competitor’s page. Google continues to increasingly reward quality long-form content with higher visibility. This was true when 2018 began and is even more true today after recent algorithm updates favor sites that have E-A-T: expertise, authoritativeness, and trustworthiness. So now you know the value of long-form content and blogging, what do you write about? Create seasonal content: run in-depth preventive maintenance guides and checklists homeowners should be aware of for each season. DIY Repairs: create content around basic repairs homeowners can and should do before calling you for service. Make this around ways to save your customers money on repairs they can do, and you’ll show that you’re putting the customer first. Deals and Rebates Information: have regularly updated articles that identify deals and rebates that are available to customers — this is especially helpful if there are government or tax-break incentives for certain HVAC and efficiency standards. The History of [Subject]: these can be fun and valuable pieces of information that draw shares and links. Create a History of Air Conditioning or anything that has an interesting background in your industry. Frequently Asked Questions: this can be used as a way to expand content on your service pages, but is also a great way to answer all sorts of questions customers often have. Create content around local information: not every piece of content on your site has to be 100% about HVAC — sometimes it’s great to add content that deals with your community. This can highlight other companies you regularly work with, schools/programs you’re involved with, or just news you want to share. Remember you’re part of the community and you can use your platform to bring more attention to important things happening around you. Now, we’ll discuss one of the elements mentioned above that’s crucial for the best HVAC SEO, including local SEO: link building. One of the ways to get inbound links is through the creation of high-quality, relevant longform content for your own site. You can also write guest posts on quality sites that allow you to link back to your site—and, as another route, you can position yourself to become quoted in online news sources. To find opportunities, monitor reporter requests at sites such as HelpAReporter.com (often referred to as HARO), ProfNet and so forth. Link building is an ongoing element of your HVAC SEO strategy. Use discernment, though. Low-quality inbound links don’t help your local SEO, and can actually hurt. To deal with spammy links pointed towards your site, consider if you want to use Google’s disavow tool to let Google know you don’t want your site negatively affected by these links. Because this is a more advanced technique, it makes sense to consult with an internet marketing expert first. There are, without a doubt, plenty of moving parts that make up a successful HVAC online marketing campaign. Armed with the guidance from this post, though, you should now be empowered to improve your own local SEO campaign or know how to choose the right internet marketing agency for your needs.